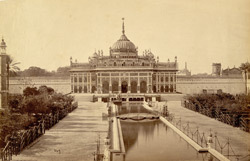 General view looking across the garden towards the Husainabad Imambara at Lucknow, photographed by Shepherd and Robertson, c. 1863. The Husainabad Imambara, constructed during the reign of Muhammad Ali Shah (r.1837-1842), was a building used to celebrate the festival of Muharram. This complex of the Husainabad Imambara is rectangular and can be entered through four impressive gateways on each side. The complex consists of a forecourt and main court. The imambara is located within the main court and has two tombs on either side.